Watching the price of a recently purchased stock soar into the stratosphere sure is fun, eh? Those green numbers serve as validation: I am one smart investor!! Seriously, I try not to get too caught up in the day-by-day doings of the stock market, because that’s a bit of a fool’s errand for any long-term investor. Considering that I am charged with putting together and monitoring DTA’s Income Builder Portfolio, however, it kind of is part of the job. And it was hard not to notice the ascent of Apple (AAPL) after the IBP added it June 26. The above graphic doesn’t even do it justice, as we bought AAPL at $182.82 per share, near its inter-day low — meaning the IBP stake appreciated 27% through Oct. 3. At the time, it was the portfolio’s biggest gainer. Even as one risks spraining one’s shoulder patting oneself on the back, though, maniacal Mr. Market has a way of playing tricks. After reaching its all-time high close of $232.07 on Oct. 3, AAPL hit the skids over the next 7 weeks, falling to $172.29 on Black Friday — a 26% decline. Just like that, our brilliant buy didn’t look so hot. One might even say the experience was humbling. I’ll get into a few reasons for Apple’s price action shortly, but here’s the deal: I am a Dividend Growth Investing practitioner with a long-range view, so day-to-day (or even year-to-year) movement rarely affects me much. Similarly, the Income Builder Portfolio was conceived as a multiple-year DGI project, and the ebbs and flows of the market mostly will be ignored. Indeed, in our next transaction, we will add to our APPL stake; I will execute a purchase order on Tuesday, Dec. 4. Apple will be the third company the IBP will have doubled-down on, following Altria (MO) and Pepsi (PEP). Some good news boosted AAPL’s price after we bought it, and some bad news (or at least perceived bad news) knocked it back down again. The intention here is not to encourage investors to look at short-term price movements. Instead, it is to demonstrate how the news of the day can affect any company — especially a high-interest, heavily traded one such as Apple. A terrific third-quarter earnings report after hours on July 31, with huge beats in both profits and sales, resulted in a nearly 6% gain the next day, when AAPL breached $200 to hit its all-time high. In mid-August, word that Warren Buffett and Berkshire Hathaway (BRK.B) had added to their already sizable AAPL stake drove the price over $213. Analyst upgrades and a surging overall market resulted in 9 consecutive winning sessions through Sept. 5, with the price hitting $229. An upbeat autumn iPhone event kept prices fairly steady even as the technology sector wobbled a little. A Piper Jaffray survey revealed that a large percentage of iPhone users were excited about upgrading to the latest models, and AAPL closed at its $232.07 high on Oct. 3. A Bloomberg Businessweek report that Chinese spies used tiny chips to infiltrate the operations of several companies, including Apple and Amazon (AMZN), saw AAPL’s price decline 3.4% over two sessions in early October. The continuing China fraud issue hit tech stocks in general and AAPL in particular, as the price fell another 4.4% in less than a week to $214. After close Nov. 1, Apple’s Q4 report again showed solid revenue and earnings beats. But guidance relative to the holiday shopping season was not overly optimistic, and the company also disappointed investors by saying it would no longer provide unit-sales updates for the iPhone, iPad and Mac. Price fell 6.6% the next day. On. Nov. 12, Lumentum (LITE) — which supplies lasers critical to Apple’s Face ID system — lowered its guidance. 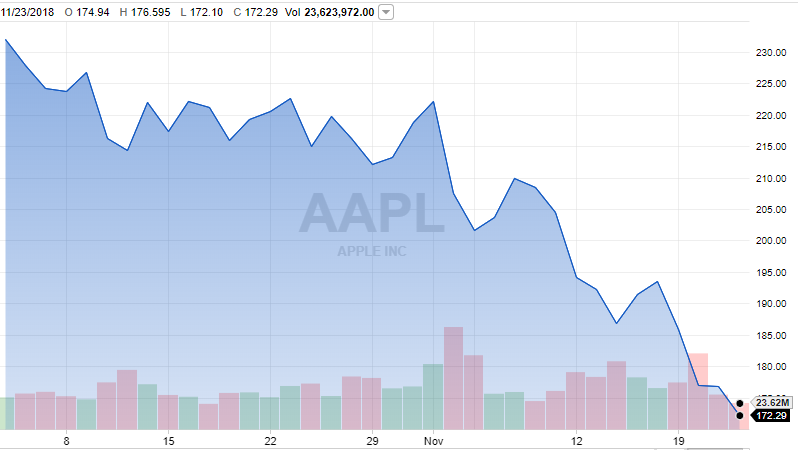 AAPL fell 5% to $194.17. A series of analyst downgrades and more supplier woes saw a multiple-session price decline of 4.3% to $185.86. The Wall Street Journal reported Nov. 19 that Apple had to slash production orders for the three iPhone models that had just been unveiled two months earlier. Another 7.3% fall followed, with the price bottoming out at $172.29 on Nov. 23. So with all the news that knocked the company around — including soft guidance, supply-chain issues and Donald Trump’s trade war with China — why have I chosen to increase the IBP’s stake in AAPL? In other words, we might or might not be able to get AAPL at a better price next week or next month, but it’s a great company that we — like Warren Buffett — want to own for the long haul. 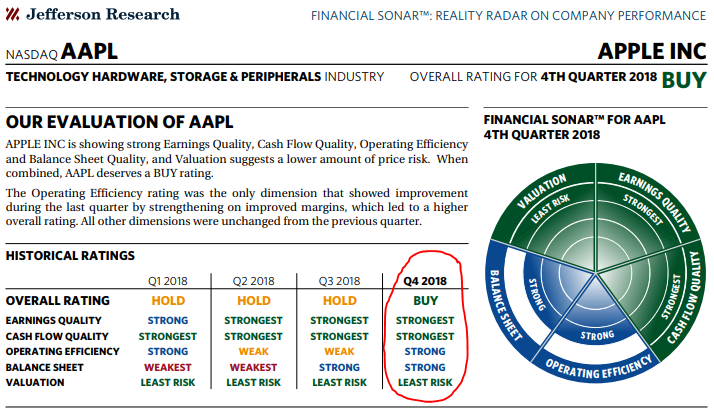 Despite some valid concerns, the latest “Financial Sonar” from Jefferson Research actually shows strengthening in Apple’s operating efficiency and balance sheet. There are plenty of other reasons to own Apple stock, including the fact that the dividend has doubled over the last six years. That’s important for the IBP, which emphasizes quality and cares about total return but is always laser-focused on building a reliable, growing income stream. Rather than repeat my detailed thesis for buying Apple, I call your attention to the articles I wrote back in June: HERE and HERE. Apple is as iconic a brand as there is in all of the world. 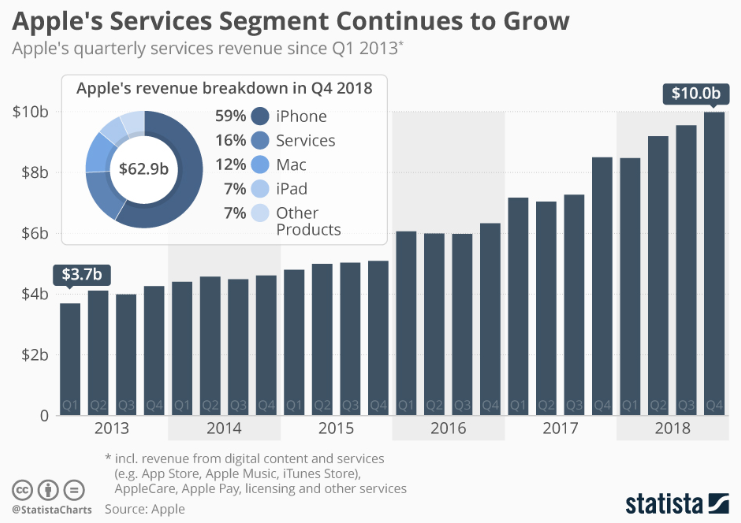 Although the beloved iPhone is Apple’s golden goose, there is so much more to company, including: consumer technology such as the iPad, Apple Watch and Macs; entertainment content like Apple Music; and the fast-growing Services segment. AAPL finished the week at $178.58, and has an attractive forward price/earnings ratio of 13.8. I will present a thorough look at the stock’s valuation in my post-buy article, which DTA will publish Wednesday, Dec. 5. Long-term, a larger Apple position will only make the Income Builder Portfolio better. In my humble opinion, of course.